A truly refined home in an enviable setting, surrounded by Oakville’s most prominent estates… Chelster Hall a stone’s throw to the west, and directly abutting the 8 acre landscape of the Ballymena Estate to the east. Simply cross the street to stroll along the waterfront via the Bel Air Promenade, and enjoy spectacular Lake views from your Master Suite balcony. Watch your children play road hockey right in front, at the quiet dead-end. Choice finishes such as marble, crown moulding, 9.5” baseboards and cherry wood are used extensively throughout. Art niches, built-in Libraries, artistic faux painting, charming wall murals and wrought iron accents add an elegant vibrancy. A centre skylight and 2-stories of windows in the Great Room flood the home with natural light. Ten foot ceilings on the Main Level soar to a 17 foot custom detailed coffered ceiling in the Great Room. Magnificent custom stone fireplaces by Tartaruga extend to the full height of the ceilings. The Main Level further offers cherry wood floors with ebony inlays, and a bright, distinguished Den adorned in mahogany and affording Lake views. The grand, custom kitchen with granite counters is complimented by a butler’s servery, a generous walk-in pantry and the finest appliances. Even the Mudroom is adorned with charming murals, and conveniently provides access to the 3-car garage. The splendor continues on the Second Level, where the Master Suite and Second Bedroom offer superb Lake views, to be enjoyed from their respective balconies. The Master further provides a sumptuous ensuite with sunken Jacuzzi tub and oversized shower with body jets. All bedrooms enjoy ensuite privileges. 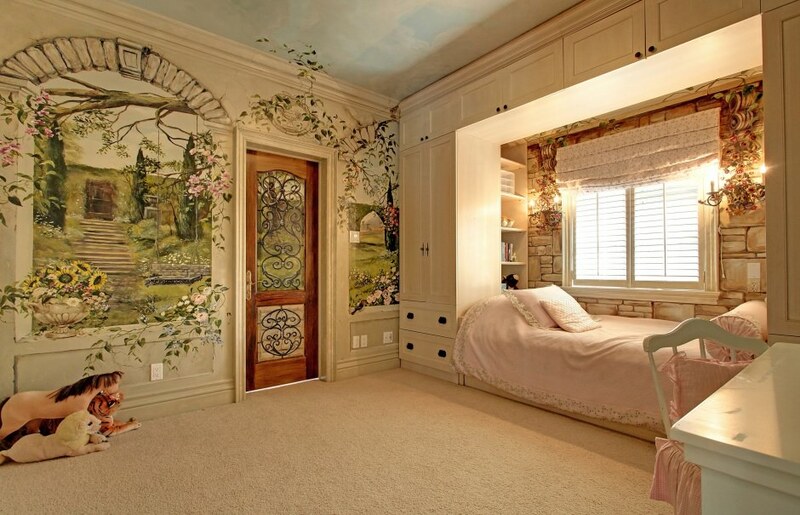 The Third Bedroom is every little girl’s dream, with a built-in bed enveloped in floor to ceiling murals in the theme of The Secret Garden. A Library and security camera monitoring centre is located on the spacious Upper Landing. The 2,761 square foot Lower Level with 9’ ceilings leaves nothing to be desired. Two additional Bedrooms are located here, each with ensuite privileges. Perfect for nannies, guests or teens. The magnificent rosewood Wine Cellar by The Wine Establishment will impress the most discerning of collectors. The bright, professionally styled exercise room with mirrored walls and rubber floors allows for safe, enjoyable and convenient work-outs. The expansive Recreation Room offers cherry wood floors, built-in walnut cabinetry, Tartaruga fireplace, plus a full Kitchen with granite counters and fine, built-in appliances. 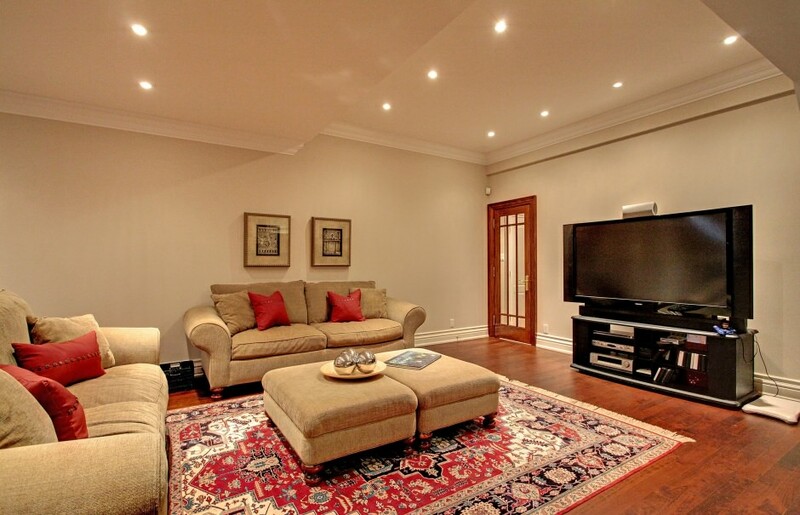 This impressive room further walks out to an armour stone walk-up to the backyard. The fully landscaped backyard offers a degree of privacy often sought, but rarely found. Lush, towering trees combined with the 8-acre property abutting the lot provides total seclusion in which to enjoy the Solda saltwater pool, hot tub, cabana, and tranquil water feature.